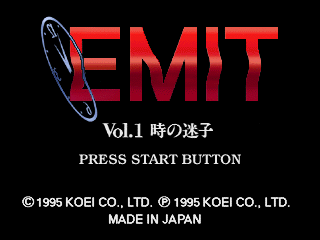 EMIT Vol.1: Toki no Maigo (ＥＭＩＴ Vol.1 ～時の迷子～) is one of three English training games released by Koei for the Sega Saturn in rapid succession in 1995. The game consists of a series of videos which can have either English or Japanese audio or subtitles (changeable any time during playback) interspersed with English training exercises. Main article: EMIT Vol.1: Toki no Maigo/Magazine articles. NEC Retro has more information related to EMIT Vol.1: Toki no Maigo.